How, when and where we work has changed considerably over the past few years. Factoring in advances in technology, a greater diversity of workers, a shift in working practices and the creation of new types of jobs and you start to get a glimpse of how the workplace is under great pressure to perform and be all things to everyone. We could possibly be at the most challenging juncture since the industrial revolution. Expectations of the physical space and how businesses engage with the workforce are both gaining greater prominence at more senior levels of business, ushering in the latest phase in the evolution of the office. Traditionally the office and the workforce have been seen as two separate functions of a business. Both of which are a necessity but not necessarily linked. This is now being challenged, not by business leaders but by the workforce. Changes which are already afoot are not just influencing property decisions but are shifting the organisational dynamics of a business. is evident is that the workforce is set to shape the workplace now more than ever before. Nearly every business has been impacted at some point by the emergence and adoption of new technology. Gamechangers in the past include; the introduction of computers, the roll-out of mobile phones and, not forgetting, the revolutionary arrival of the world-wideweb. For some, imagining a work-life without these is an alien concept. Advances in technology and its accessibility is enabling agility for businesses and their workforces. Technology has infiltrated our working lives leading to a growth in remote working, the ability to work flexible hours and even the creation of new types of jobs. Equally, our lives outside the workplace have significantly changed too. We are now more global, more experiential and increasingly adept with social media. In some cases, the lines between work and personal time have become blurred, putting pressure on one or the other to adapt. The arrival of robots, artificial intelligence and increasing levels of automation of job functions are forcing businesses to pay greater attention to the future of work within their firms. It is clear that technology is at the forefront of the debate on the evolution of work, and it is the workers who are putting themselves at the heart of that debate. The modern workforce is at its most diverse with more women in employment, more self-employed people, the emergence of the gig economy, and a workforce that now covers five generations. Whilst diversity is to be championed, there are a number of factors that businesses will need to address. The generational gap is one of the most obvious points of difference. The views and outlook of older staff members may differ from those of the millennials or even generation Z. The agility and flexibility that is sought or even expected by younger generations could conflict with the practices of older workers or that of their business leaders. Understanding how the workforce is engaged is key to harnessing change and diversity, whilst also delivering the best solution. Not being restricted by the stereotypes of how work ‘used to be’ is one step towards connecting with the workforce. Corralling and bringing together workers of different generations is expected to be a prominent business issue. It could be made all the more difficult with the growth in the alternative/contingent worker model. This is a person who is effectively self-employed and enjoying ultimate flexibility. Not tied to one job or even one business and employed on an ad hoc basis. One that employers will find difficult to manage if their organisational structures are more traditional in their composition. Trying to achieve inclusion or a sense of corporate affiliation will no doubt be difficult, but could the workplace offer the solution? As much as a fixed base flies in the face of flexibility, human instinct draws us to a home. The office is one way a business can satisfy this. For some the workplace needs to emerge from its utilitarian image of old to achieve this and more. In a tight labour market, domestic and global, employers strive to achieve minimal disruption from staff attrition. The growing transient nature of the worker, whether that is on a contingent basis, or in the case of older workers those seeking an alternative career, is probably the costliest element both in time and finances for a business. However, the greater the agility and flexibility is in the workforce, the greater the businesses will be tested. Again, the workplace can be a powerful tool in the much discussed battle for talent. For those existing workers, the office and the commitment to the space by the employer instils a sense of worth for the worker. Achieving the best in design, the best in function, the best in location and the best in amenities will add to an employee’s belonging to the firm. In our previous edition of ‘The Occupier’ we discussed ‘Wellness in the Workplace’. Creating a happy environment for the worker can promote productivity, learning and integration – a vital element in staff retention of the modern workforce. As the business landscape evolves, there is one thing that is consistent throughout and that is the employee. Whether they work at home or in the office, part-time or full-time or a new recruit versus a ‘lifer’, the importance of a worker’s perspective and opinion is growing amongst businesses. A worker’s propensity to vote with their feet and move jobs is a powerful message to business leaders and is prompting greater engagement. Promoting workforce inclusivity at all levels is becoming pivotal for business agility and a shared sense of togetherness, benefitting the workplace and the business. 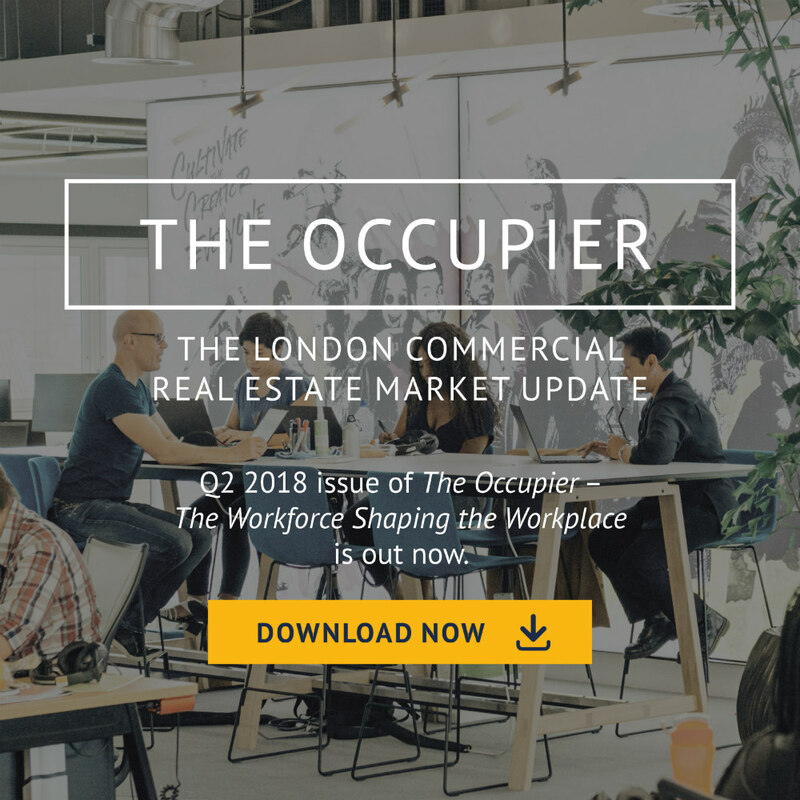 Collaborating with the wider workforce on real estate matters is one area that is gaining traction but is also proving to be tangible for the workers in which to note their input and benefit from. Decisions on the type of amenities, to décor and furniture, even through to embedding new technology, can produce a dramatic improvement for employer-employee relations and greater productivity. Whilst a firm’s decision can be informed and led by employee and cross-company interaction, ultimately the final decision will rest with senior management. It is at this level that there is an increasing level of collaboration and input that is now being sought, largely due to the way in which business units such as technology and HR and their functions are inter-twined. The role of the workplace is moving higher up the corporate agenda. It is seen as a conduit to support the wider HR, IT and sales functions and input from a wider range of corporate functions is now important more than ever, especially with a greater need to attract and retain talent. The decision-making landscape has far more ‘influencers’ involved than just a few years ago. The days where a business owner and/or chief financial officer makes decisions based on their sole preferences are gradually disappearing. As property consultants, we are increasingly interacting with more people from within our client’s businesses, with the ultimate goal that a property decision is becoming more informed. Firstly, a location which was right previously may not be for future business needs and access to talent. Secondly, current technology may not be fit for purpose. These are just a couple of headline considerations that not just one person can feasibly make a decision on. That is why the roles of a Chief Technology/Information Officer, Head of HR, or even sales directors now must add an element of real estate to their responsibilities. Space is an asset with the ability to maximise and support a corporate agenda. The ability to meet business goals, increase productivity, provide a sense of team and community and increase employee engagement are just some elements that show that the office remains an important feature of any business. To ensure that the office and workplace remains relevant in the 21st century, flexibility will be the key – from the way in which space is obtained, leased, designed, used and ultimately who fed into those decisions. Businesses that fail to adapt to new ways of working and remain inflexible could face difficulty with staff well-being, growth of the right workforce and attracting new business. In order to counter this – existing models of leadership and decision making need to evolve – moving towards a more holistic and inclusive approach. While traditional considerations for space will continue to exist in some form, the requirement for more collaborative space, entertaining space and non-desk space will challenge existing ideas of office design. Throw in advances in technology (both current and yet to come), sustainability and wellness, and the decision-making tree has grown that little bit bigger. It is an exciting time in the evolution of the workplace and workforce, as normal practices are disrupted and challenged.